The news that Vito Fossella was a possible third GOP candidate in the 13th Congressional race was too much for the McMahon campaign not to jump on. McMahon took the seat that was occupied by Fossella when Fossella decided not to pursue another term due to his personal life issues and a drunk driving arrest. The email, sent to Atlas by a friendly reader, both chastises the GOP for what McMahon’s campaign calls a “three ring circus” and pleads for donations. Unbelievable. The Republican Party is once again running scared and scrambling to field someone to run in NY’s 13th Congressional District. Vito Fossella is just the latest retread candidate to surface in this GOP three ring circus. Mike McMahon continues to be an independent voice for the people of Staten Island and Brooklyn and has a proven record of advocating for job creation, improving our infrastructure and sound economic protections for the families of this district. We are in it to win it. With your support we will put the politics of yesterday to rest and move forward to the achievements of tomorrow. We are nearly half way to our goal of raising $10,000 by next Thusday at midnight. Contribute $10, $25, $50 or more now to Congressman McMahon’s re-election rapid response efforts. Don’t let the politics of the past continue. Help us today. Do I sense a tiny hint of fear or frustration over the news that Mr. Fossella has decided to consider running again? This must have been on the minds of the McMahon people for a while now. Did they think it was impossible for Fossella to come back? If so, that was a mistake. Fossella has certainly remained popular with GOP voters from what we’ve heard. And despite his life choices and personal faults, this is a year where Republicans are expected to win seats. The climate is currently against Washington, and we continue to see results of that fact nationwide. McMahon has, to his credit, been very careful in how he’s voted on the more controversial issues, such as health care. But that might not be enough. He’s a Democrat in a district that has been consistently Republican/conservative for nearly two decades, if not much longer. We here at Atlas believe that Fossella has a very good opportunity to beat Mr. McMahon this November, even with Mike Grimm sitting in on the Conservative Party line. We haven’t always been thrilled with Mr. Fossella in the past, and there are some issues that some of us, being more libertarian, do not see eye to eye on with him. But speaking merely of the political realities and not of our own political preferences, many of us agree that a Vito Fossella campaign would be far from a long-shot. That, more than anything else, is why his potential return to politics has been played up so much in the media. And that’s why we’ll be watching this race with great interest. One day after an “Executive Committee” of Staten Island Republicans nominated Vito Fossella to run for the Congressional seat he gave up in 2008, State Senator Marty Golden said “family” [issues are] always a factor in an election. Golden had been asked by reporters whether voters should take into consideration Fossella’s embarrassing personal life: a DUI arrest in Virginia and the subsequent revelation that he had fathered a child there. 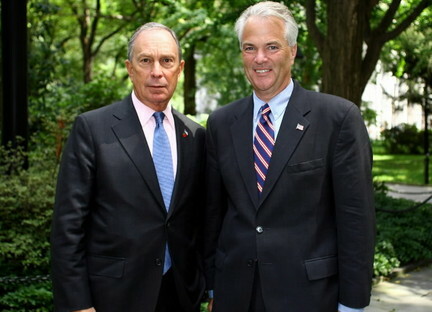 Michael Bloomberg was also reported to have side-stepped a few questions about Fossella’s prospective nomination. The Mayor supposedly said he hadn’t heard from Fossella about wanting to run again. It’s always hard to be rejected, but imagine how it’d feel to run for Congress and then have your party spurn you for Vito Fossella. “I was completely shocked,” said Annette Battista, a 75-year-old GOP stalwart who cast one of the four “no” votes. “Vito’s been on television, and every time somebody says, ‘We hear rumors that you’re going to run,’ he would look right in the camera and say, ‘No, that’s not true,'” she said. Battista also has problems with Fossella’s judgment, citing his drunk-as-a-skunk arrest in Virginia. “Instead of calling his chief of staff to bail him out, he called his girlfriend, which was the wrong move,” she said. Partisan politics aside, a huge problem with Vito Fossella possibly running for any political, elected office is this: what about Mr. Fossella’s personal judgment, discernment, self-restraint, self-control, hypocrisy? Vito Fossella He has demonstrated that he has all those character flaws. Is this who the NY 13th C.D. voters really want to represent them in the U.S. Congress? Hypothetically speaking, I personally wouldn’t vote for Eliot “Client # 9” Spitzer for any political office because he too has demonstrated poor judgment, hypocrisy and duplicity. “On February 26, 2010, National Journal Magazine released its annual ‘Vote Ratings’ issue, and I have been rated the Member in the center of the entire House of Representatives. I am honored to have been named the most centrist, moderate Member and believe this ranking demonstrates my independent and balanced approach to legislating. The Jig is talking about a lot of “blood” being on people’s hands. We all know that’s kind of like the logic people use in blaming George Bush for the 9/11 attacks. I should say: it’s the absence of logic. It’s ridiculous to say that because someone is involved with someone who might be related to someone who was never convicted for a crime, let alone charged for one, is guilty of anything more than living an average American life. If that’s the best the Jig people can come up with against any of the counter-establishment reformers like Roy Antoun and Jonathan Judge, then that’s pretty pathetic. Oh, one other thing. Marty Golden ran over and killed a woman while he was driving his White Whale aka Cadillac Escalade (what a humble car for a former police officer–guess the pay was good Marty, or is the Bay Ridge Manor paying the bills?). That’s why he can’t drive himself places anymore. He depends on a driver. It seems like every time he drives himself somewhere, something really bad happens. So, based on what I’ve seen, the only GOP person who has actually be documented as having caused any deaths in this world is Marty Golden, the “greatest” State Senator–the Golden Calf. Sounds like the Blood’s on Marty Golden’s hands and no one else’s.